At DCH Chrysler Jeep Dodge RAM FIAT of Temecula, we offer new Chrysler, Jeep, Dodge, RAM, and FIAT cars in Temecula, along with used cars, trucks and SUVs by top manufacturers. Our inventory includes a wide-ranging selection of vehicles by some of today’s top manufacturers, including Chrysler, Jeep, Toyota and even Honda models. Our sales staff will help you find that new model or used car you have been searching for in the Moreno Valley, Escondido & Hemet region. For years, our financial staff at DCH Chrysler Jeep Dodge RAM FIAT of Temecula has offered expert advice for those seeking a great Chrysler, Jeep, Dodge, RAM, or FIAT car loan or lease. Our service doesn’t stop there. Many Temecula, Escondido & Hemet customers return to our dealership because they know we offer unbeatable service. This includes all areas of dealership, including Chrysler, Jeep, Dodge, RAM, and FIAT car repair and our professional car parts department. 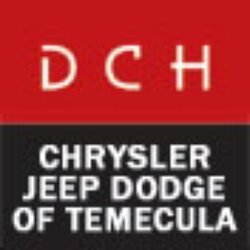 You can reach DCH Chrysler Jeep Dodge RAM FIAT of Temecula any time by filling out our contact form, by calling us, or simply visiting our Hemet and Escondido area Chrysler, Jeep, Dodge, RAM, and FIAT of Temecula dealership at 26845 Ynez Road, Temecula, CA 92591.